This page was inspired by Colin Bowlt. The trust realised that he had been putting up notices on the noticeboard by Murphy's Field. We thought these should be accessible to a wider audience, so began to posted them online here too. This most recent article was written by John Edwards : Enjoy. Have you seen a Hawfinch in Ruislip Woods yet? The winter of 2017-18 is the best time for almost one hundred years to encounter one or more of these shy and elusive finches. During last autumn a major influx of the species into the United Kingdom took place with birds arriving from points further east and many thousands being reported at watch points in the south and east of the country. This movement of birds continued into November and soon they were being reported from any suitable woodland where they eventually settled for the winter. Ruislip Woods is mainly made up of Oak with some Beech but also includes large stands of formerly coppiced Hornbeam. Now it just so happens that Hawfinches love Hornbeam so it was hoped that our local woods would share in this influx. Forty years ago a very small number of Hawfinch used to breed in the woods around Ruislip but numbers declined to just the odd sighting in the 1970’s and then there were none. Perhaps they would return this winter? 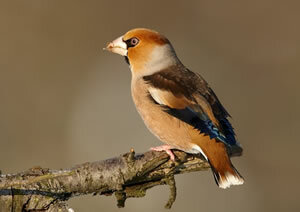 During the October influx period one lucky observer chanced across a flock of up to forty Hawfinches in Copse Wood. A most remarkable sight and very exciting but sadly the birds did not linger and had soon moved on. Was this a foretaste of what was to come? During November the first sightings of wintering birds started to come in with up to nine present in Bayhurst and Mad Bess Woods. Always elusive and difficult to catch up with they were nonetherless in there somewhere. During the next few weeks reports suggested that the birds were settled around the pond in Bayhurst and sporadically in Mad Bess Woods and persistence normally resulted in a sighting of them. The New Year arrived and a concerted effort was made to survey the whole of the Ruislip Woods for these charismatic large finches. One day I was having a good look around and was able to confirm that there were at least twenty five birds in Mad Bess Wood. They were in the canopy and feeding quietly but good views could be had with a bit of field craft. Good news indeed for the return of the Hawfinch to the Ruislip Woods. Hopefully the birds will decide to stay and recolonise and it would be wonderful for a few pairs to remain and breed once more as the last confirmed breeding record was as far back as 1972. 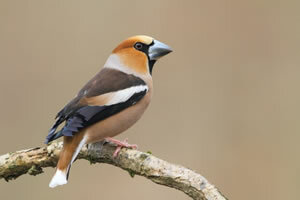 The Hawfinch ‘Coccothrausters coccothraustes’ is the largest member of the finch family. It is coppery brown in colour with striking white wing patches which are clearly visible in flight. It sports a huge bill which is used to crack open the seeds of various plant species and especially those of Hornbeam. The birds are very shy and retiring and one needs to be quiet to stand any chance of seeing them. A walk through the woods would not be complete without the hope of coming across these birds with the best chance in the two quieter woods of Mad Bess and Bayhurst. When walking (quietly) along the paths and bridleways keep an eye on the tree canopy and look out for the birds as they feed and perch unobtrusively above your head. Indeed, you may be very lucky and see them lower down and maybe even on the ground. The Scout Memorial in Mad Bess Wood and around the pond in Bayhurst Wood are perhaps the most reliable places to see them. There will never be a better time to see a Hawfinch locally and this is literally a chance of a lifetime so get out there and see what you can find. By March we can expect them to be on the move back to their breeding grounds further east so they will not be around for much longer. John Edwards. Ruislip & District NHS. Thank you to Wiki Media for the pictures. Please don't be put off by the age of these articles. You will find here some amazing nature writing and beautiful photograhs to accompany it.